Final Word for 2013: Be Courageous! Before I begin with my final piece of wisdom for 2013, I would like to take a moment to thank all of you that followed my blog, liked my posts and have been praying and journeying with me through out this year. You guys have been such a blessing to me and have encouraged me in some of the darkest hours of my life. I did not know how people would receive my realness and transparency but I am thankful that God has allowed me to share my life with you. Thank you for making this year easier and for allowing to be real with myself and with God, producing ultimate freedom. THANK YOU! I was praying for a final word of wisdom to share with you, a final lesson of 2013 if you will and what came to me is: Be Courageous. I sat on my bed and reflected on the idea of courage and bravery in the presence of fear. As I sat and thought about courage, God began to minister to me about how courage is not the absence of fear but rather the strength to not allow fear to overrule your life. Fear is always present, it comes to hinder us from moving forward and enjoying what God has for us. Some of us are afraid to fail so we don’t try, some of us are afraid to succeed so we don’t give our all- our fears limit us from living a life full of joy. Some of us are afraid of the new year. 2013 was our year of struggle and we don’t know how to handle 2014 being our year of blessing so we sabotage our destiny and do whatever we can to limit God’s hands from blessing us. We sabotage things we are afraid of. Think about it, if all you ever experienced was bad relationships when the right person comes along -you can’t handle it. You sabotage the relationship. This new year is not the year to live life in a circle, going through the same old trials and test, the same old routine because we are scared of change- this year is not the year to live in defeat when we can be victorious. This year is not the year to live bound when Christ has come to set us free. This year is not the year to live life in regrets but to relish in the blessings of God. This year is not the year to be afraid but to be courageous. That’s a good reminder as some forget that they can and they do have the ability to be courageous. 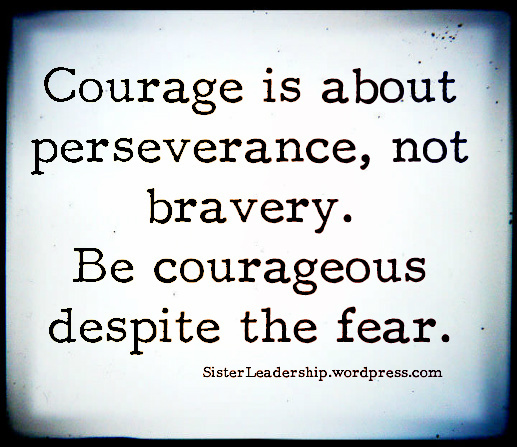 And the bottom line is that being courageous is what we must do if we will survive joyfully and wonderfully. This world spins fast and there are great tar pits that are hidden to us. By being courageous we will know and continue to remember how to be courageous in the face of everything, everywhere. Thanks for the comment. Your words were beautifully stated and I agree completely. When I wrote today’s post I was being reminded that I had the ability to be courageous, I forgot that I could own courage. It’s crazy how when you’re in such a low place you forget about the tools God give you to live a happy life. Courage is necessary to live free and to survive living as such. Honey you have blessed my soul today, thanks for your words!